This is a piece I wrote for the art history based public speaking competition ‘Articulation’, which I took part in earlier this year. The Charnel House, painted by Pablo Picasso between February and May, 1945, and perhaps his most disturbing painting. He did not name the piece himself, simply calling it ‘my painting’ or ‘the massacre’. Its title was given by a public still reeling from the events that inspired its creation, and Picasso refused to go against this by renaming it. The large scale of the painting belies the perversely humble subject matter. 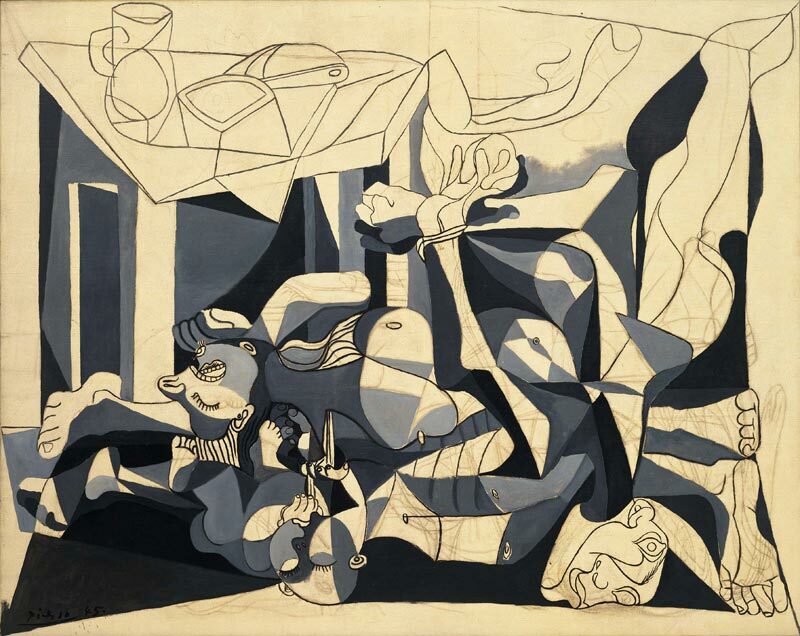 Picasso had watched a short documentary detailing one event in Spain during the course of the war, the story of a Spanish Republican family killed in their kitchen. It was also at this time that the first photographs of concentration camps were being released to the Western media. It is this macabre mixture of brutality and domesticity that creates the underlying tension of the piece. He has returned to a style most closely associated with his epic piece Guernica, as here he is also reflecting the black and white of contemporary photography, although this time not newspapers, but the film reel of the documentary. This gives the painting a stark sense of contemporary documentation – Picasso revives the history painting genre in such a way that the viewer cannot help but be drawn into an emotional stake in the events. Picasso’s use of colour bravely strips the piece back to the elemental. This is reminiscent of the Analytical Cubist treatment of colour; he forces us to consider the forms, giving us no distraction with bright colours. He also removes the emotive possibilities of colour; we understand the scene for what it is, not how we are made to perceive it. We should perhaps also take into account the spiritual significance, black representing evil, white purity and innocence. Picasso thus demonstrates the interplay between good and evil by placing these colours adjacent, the grey perhaps representing how ambiguous this interplay can sometimes seem. This monochrome colour scheme makes objects easier and simultaneously harder to understand: they are laid bare in front of us, but they barely seem to make sense. We can see parts of feet, hands, a pupiless eye stares at us from the bottom right corner. Then in the background, or perhaps above these objects, we see a table, with a still life. Picasso has applied a mixture of both Analytical and Synthetic Cubism to the piece, with the table being viewed from several different angles, confusing but almost reassuring, we are drawn away from the atrocity by contemplation of this form. But it seems also to act as a message for how we should view the painting, we must examine what has happened as strictly as we try to understand the composition of the table. Synthetic Cubism is applied through the layers of colour and line, with the whole family almost seeming to blend together in the foreground of the painting. This too could read as an aid to understanding, we must view the massacre as part of a build up of events and circumstances. Thus the idea is first introduced that this is a universal image, one that had occurred before, and would be repeated. The piece contrasts most clearly with Guernica in that it is quite clear that we view this after the event, it has not got quite the same sense of violence in action. The mouth of the woman, depicted by a simplified set of lips, with the teeth protruding in what might in other circumstances be interpreted as a snarl, and the compositional arrangement that means that we view her head upside down, with her hair hanging down, clearly demonstrates the deaths are in the past tense. This is contrasted by the depiction of the child, whose presence is deeply imbued with pathos. While the mother’s fate is all too clearly expressed, the child could only be sleeping, hands drawn up to the chest, and with a serene expression achieved by the depiction of simple oval eyes, closed, although facing the viewer. Moving towards the right of the painting, it becomes almost impossible to discern where one family member ends and the other begins. The bound hands of then male figure embodies and makes explicit the idea of the family as victims, innocent and without the power to defend themselves. The interplay of the harlequin pattern, particularly beneath the tied hands, suggests that Picasso has tried to include a depiction of his own sorrow and sense of loss in the painting. Picasso lost many friends during the war, and was deeply affected by the afflictions of his fellow countrymen, and in the harlequin, so often symbolic of his own character, we can see his subtle homage to the suffering of his friends, symbolically placing himself alongside them, at a time when he was unable to really help. He remained neutral throughout both the First and the Second World Wars, resident in France rather than his own country, but the year before the work commenced on The Charnel House Picasso joined the French Communist Party, and remained a member until his death in 1973. In this piece he makes a tacit, but powerful statement against Fascism. So it is with a deep sense of personal involvement that Picasso is able to create a piece in which he so strongly conveys emotions to the viewer. Still Life, often used in the Renaissance to depict dead animals, draws unsettling comparisons between the household objects, and the dead family who own them. They themselves have become objects in their house, but through an atrocious act of violence and brutality. Picasso said he left this part of the painting unfinished deliberately, as to finish it would be the same as to end it, or to kill it. Thus he has stopped himself from the final moment of creation that he saw as the end of a painting, its death. He has not followed the example of the perpetrators of the crime he depicts. Progressing again towards the right of the panting, Picasso has furthered the sense of confusion of space through his depiction of the corner of the room. It is difficult to tell whether or not this recedes or protrudes within the picture place, so we are unable to console ourselves even with a set measure of space. Thus Picasso creates a sense of awkwardness that pervades the painting, confronting the viewer with the ugly truth of human nature. What is striking is how little he has needed to represent in order to convey such a deep and universal message. We do not need to know about the documentary, or the historical events. Picasso has been able to present a basic, rhetorical question of man’s brutality towards his fellow human. He forces the viewer to contemplate this on a more universal level than in any other of his paintings. Apart from the contemplation of the table, which still acts to educate the viewer’s understanding of the painting, he offers no relief. By uniting colour, composition and subject matter for one cause, Picasso has created a piece distinctly born of his own emotional responses, and the events of his age, but which remains disturbingly relevant in our own time, and, as no answers are given to the question he poses, will continue to be so in the future. I found this all very interesting. Could you please provide a bibliography? I’d be interested in reading more about it and making a comparison with Guernica. This piece was written for a public speaking competition during my Sixth Form studies, and thus I’m afraid I can’t provide a particularly thorough bibliography. I first saw the painting in a Tim Marlow programme reviewing a Picasso Exhibition at Tate Liverpool (I think), and other than that most of the knowledge about the Civil War etc came from art history A-level classes when we discussed Picasso in relation to political events, looking, as one would expect, at Guernica mainly. So I’d suggest reading about the Spanish Civil War. It may be possible to find the catalogue for the exhibition, other than that I’m afraid I can’t provide any information as to a particular book which relates to The Charnel House! Sorry to not be of more use!